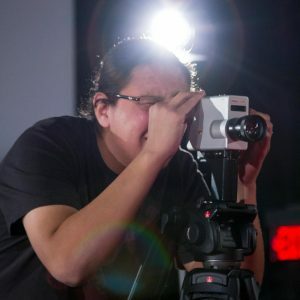 Damien Eagle Bear, a Blackfoot filmmaking from the Kainai Nation is a graduate of the Indigenous Independent Digital Filmmaking program and the Cinematography for Film and Video at Capilano University. At an early age storytelling excited Damien especially the ones his grandma told of the trickster Napi (the Old Man). This led to Damien’s first documentary film Napi (2012) which opened the 37th American Indian Film Festival in San Fransisco and continued play at numerous festivals. Since graduating he was worked as a freelance filmmaker working for the University of British Columbia, Provincial Health Services Authority – Indigenous Health, and Fraser Region Aboriginal Friendship Centre Association. He has also work as a cinematographer for the documentary web series Mavericks: Dr. Esther Tailfeathers, the short film Indian Giver, and the feature documentary Cesna?em: City Before the City.